The new policy allows the use of weapons to “protect their lives, health and property” but not against “women, disabled persons, and minors, unless they attacked you with a group and arms,” according to an analysis by Russian media site Arguments and Facts. These weapons include “long-barreled weapons, pistols, revolvers, ‘home-made tubeless firearm units’ with cartridges, bullets and ammunition; gas pistols and revolvers, electric shock devices, devices equipped with tear gas, and home-made spark gaps,” according to the state-owned TASS news agency. Additionally, those who have attained licenses are prohibited from carrying weapons during rallies, meetings, demonstrations, recreational activities, and religious ceremonies, according to Arguments and Facts. During certain events and parades, however, cossacks and participants of the events are allowed to carry swords as part of their costumes. Prior to the change, weapons were only allowed for hunting and sporting events, as well as training and shooting practice. Laws also prohibited rifles, pistols, and revolvers, according to GunPolicy.org. Many Russians, however, don’t approve of this amendment. “Horrified. I am horrified,” one Muscovite told Business Insider. Currently, only 46% of Russians feel safe walking alone at night, compared to a global average of 82%, according to the Legatum Group’s annual survey of global prosperity. 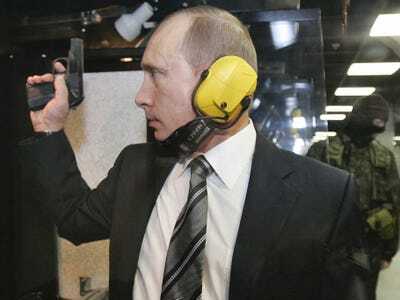 Gunpolicy.org estimates the number of both legal and illegal guns in Russia at 12,750,000, making the rate of private ownership about 9 firearms for every 100 people. The rate of registered ownership, however, falls much lower — 3.5 guns per 100 people. For comparison, the U.S. has nearly 20 times more guns than Russia (on the low end of the spectrum), anywhere from 270 to 360 million. Therefore, the estimated rate of private ownerships is also much higher: 101.5 firearms per 100 people. In 2013, 8,454 people were murdered at the hands of someone wielding a gun in the U.S., according to FBI Statistics. Unfortunately, Russia doesn’t break down its homicides by weapon. Speaking the same day as the change, President Vladimir Putin said: “You can get a lot more done with politeness and a weapon than with politeness alone,” according to the New Republic.